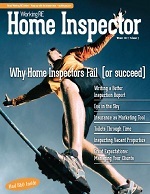 Editor’s Note: This story is reprinted for Working RE Online, Home Inspector’s Edition. 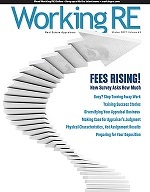 To opt-in please email subscription@workingre.com with “Home Inspector’s Online Edition” in the subject. In a recent Working RE story, Appraiser: I’m No Home Inspector (WorkingRE.com, Library, Issue 24), appraiser Tony Bamert says he is asked to do work that he is not qualified for- namely that of a home inspector. Several home inspectors say they know how Bamert feels. Inspector Jon Rudolph has experienced similar “cross over,” when working for lenders. “I have seen a trend in the last six months or so where my (buying) client’s lender and even the mortgage insurance company have asked for my professional opinion on the physical condition of a subject home, stemming from the appraiser’s comments,” said Rudolph. David Brauner is Editor of Working RE magazine and Senior Broker at OREP, a leading provider of E&O Insurance for appraisers, inspectors and other real estate professionals in 49 states (OREP.org). He has covered the appraisal profession for over 16 years. He can be contacted at dbrauner@orep.org or (888) 347-5273. Calif. Insurance Lic. #0C89873.